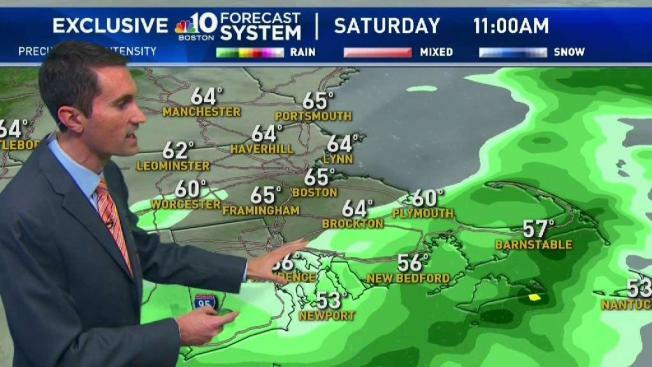 Saturday morning rain will clear out this morning, though parts of Cape Cod see precipitation into the afternoon. This afternoon, temperatures will warm up, reaching up to 70 degrees in some areas. It will be cold overnight and temperatures will average in the 50s, and perhaps 60s, Sunday in parts of New England. The driest weather is in Vermont where the sun will first come out. This rain making front moving offshore is associated with the former blizzard from the Midwest, that storm has weakened and is no longer much of an influence. But it did push warmer air in, along with this rain. We have a few more hours of rain along the south coast, and rain will not end on Cape Cod until this early afternoon. As the sun comes out, the temperature rises out of the 50s in to the 60s, headed for the 70s in many locations. Even some of the ski areas may near 70 degrees at the base today. Wind is from the southwest 10 to 20 mph. Weak high pressure brings in cooler and dry air tonight, with a mostly clear sky we may cool to freezing in northern New England, and 40 to 45 degrees south. Another storm has formed and is intensifying quickly to our south. A severe weather outbreak this afternoon in the lower Mississippi Valley should diminish enough that when it gets here tomorrow, we have increasing clouds and just rain showers late in the day. Most of the day is dry with a high temperature in the 40s north, 50s to low 60s south. Rain will become heavy tomorrow night with a chance of a thunderstorm along the south coast, temperatures will hold in the 30s north, and 40s to low 50s south. Wind from the south will push much warmer air in for the Boston Marathon. As cold rain continues in northern New England, mild and muggy weather with a few sunny breaks should develop south. The temperature on the marathon route may actually get close to 70 degrees if we get enough sunshine. But there’s also instability in the atmosphere and a shower or downpour could happen at any time. Wind on the race route will go light and variable for a time midday, then pick up from the west late in the day. The dewpoint may warm past 60 degrees, meaning muggy conditions, before drier weather comes in late. In the mountains of northern New England we have a flood watch in effect, for melting snow and rain contributing to rising rivers. Colder air in the backside will be helpful. Colder air comes in Monday night, and rain may end as snow in our mountains. Tuesday should turn mostly sunny with a high temperature in the 50s. Yet more unsettled weather is likely do arrive either later Wednesday or Thursday, and we may have significant rain late in the week. That accompanied with rapid snowmelt could cause more significant rises on rivers, we may end up with more widespread flooding. The early outlook for Easter weekend is for showers slowly ending with temperatures near seasonable levels. Some of our mountains may end up with more snow next weekend. Stay ahead of it with our First Alert 10-Day Forecast.